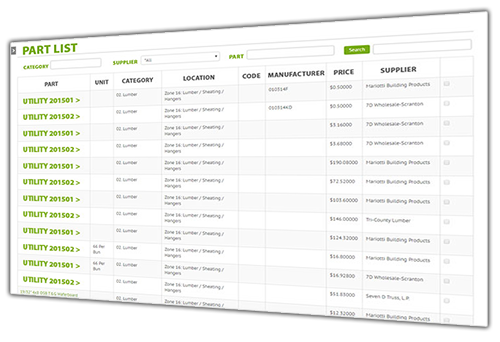 Inventory management software for large hotel builders. Our client is a major manufacturer of modular hotels, school dorms, and houses using wood, steel, and concrete construction. All of their buildings are constructed in modular pieces at a production factory before being shipped and assembled on-site. This allows them to operate with high rates of efficiency in regards to both cost and craftsmanship. Software Solutions created a custom inventory management system to track all parts used. The system creates purchase orders, manages receiving parts, manages invoices, and tracks all part-usage. Each part can come from multiple vendors with different prices. All of this information is taken into account to be sure purchase orders are made using the best prices available for each part. It also manages daily part pull-lists to automate work that was originally done manually with limited information. A modern-touch screen interface was crafted to display relevant information in a friendly way that is easy to use. This interface is not only available on desktop computers, but also rugged Android barcode scanners that are commonly used in the warehouse workplace.